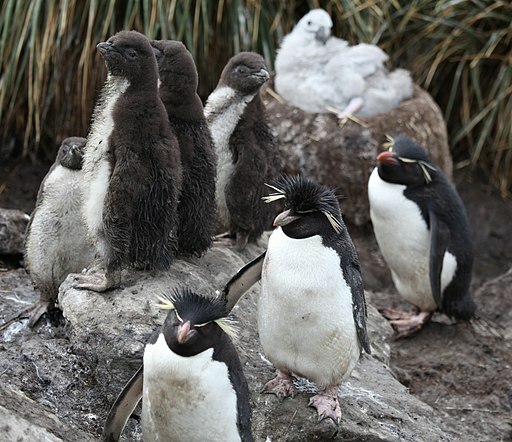 Rockhopper penguins comprise three different species: the Southern, Northern and Eastern rockhoppers1. Currently they are distributed and inhabit many offshores sub-Antarctic islands. Rockhoppers are among the smaller species of penguins and they are better known to us thanks to their ability to displace using both feet performing little jumps (i.e. hopping). Unlike other penguins that slide on their bellies to get from one place to another, rockhoppers are audacious climbers, because their habitat is very rocky, hence the “rock-hopper” name. 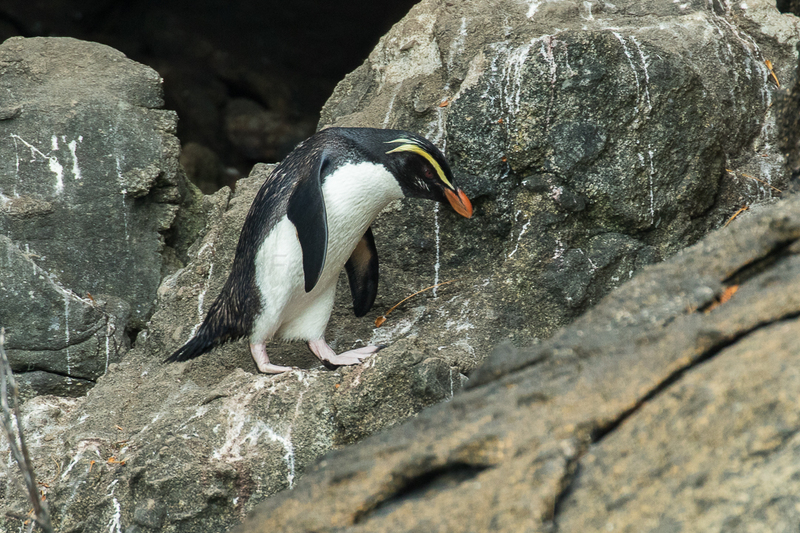 Unlike other penguins that love a fishy diet, Rockhopper diets are largely based on krill and other small invertebrates. This means that optimal levels of prey abundance are heavily influenced by fluctuations in oceanographic conditions, like temperature, the mixing of the water, and concentration of phytoplankton. For adult Southern Rockhoppers, a critical “food” moment occurs during the reproductive cycle2 . Every year, male Southern Rockhoppers return to shore in small groups after months of oceanic life. Females show up a few days later, and the breeding season begins. Year after year, rockhoppers return to their same old nests and start a new clutch. After laying two eggs, moms and dads hang around their nests for a few days, before the male leaves for 2 to 4 weeks to feed in the ocean. When the male returns, it is the female’s turn to replenish her reserves. This will occur when the eggs are about to hatch. During this period, females are in charge of feeding, while males are in charge of chick guarding. Males will only eat again approximately 3 weeks after that. Such a long cycle of eating and non-eating means that for males, the first foraging trip during incubation is the most critical for their survival. In a recent study2 , researchers have discovered that this critical foraging period is not as predictable as we thought before. Between 2011 and 2014, 62 male Rockhoppers from different colonies in the Falkland Islands were followed during the incubation period. These penguins were equipped with GPS loggers and time-depth recorders to record all the vital information about their journeys and the environmental conditions they encountered. The researchers were surprised when they saw the data. Looking at the first years’ data (2011-2013), some of the penguins performed short daily trips in shallow waters and returned to spend the night at their nests, instead of engaging in the usual 3-week long trip. In 2014, however, most of the penguins went back to the previously known foraging patterns, in which they explored far away distances and stayed offshore for several weeks, while the female stayed incubating the eggs. Such findings show that some species are capable to change their habits to some degree. In biology, this is known as behavioral plasticity, meaning that some species can show certain flexibility in behavior (e.g. choosing long vs. short foraging trips) when conditions fluctuate. As predicted, most of these behavioral changes were in relation to oceanographic conditions prevalent during those years. Years that showed a decrease in SST (sea surface temperature) were those in which penguins foraged mostly short distances, while years with normal to increased SST where those in which males foraged offshore. Fluctuations in temperature conditions and the amount of mixing in the water column most likely had impacts on the distribution of phytoplankton, which eventually serves as a good predictor of the presence of krill and small invertebrates, these penguins’ favorite food items. What does this mean for the future of Rockhoppers? Such variations in temperature conditions could affect the energy expenditure in penguins. Years with decreased SST will mean better energy efficiency balance by penguins, because their prey will be available within a close range from the colony and penguins will not have to travel as far. In contrast, an increase in sea surface temperatures in the South Atlantic and Southern Oceans will inevitably force penguins to travel longer distances, threatening the survival of males. A warming planet therefore poses a threat for Rockhoppers, as increasing SST and alterations in water column mixing within the ocean have already been recorded and are predicted to continue. It is our duty to safeguard our planet, for the health and future of Rockhopper penguins and all other creatures that will be impacted by these changes. Rockhoppers…are they different that what you thought? Did you learn something new by reading this post? Let us know what you think. Also, please help us continue to learn more about penguins by donating to Penguins International. We more than appreciate your support! Pütz, K., Harris, S., Ratcliffe, N., Rey, A. R., Poncet, S., &amp; Lüthi, B. (2018). 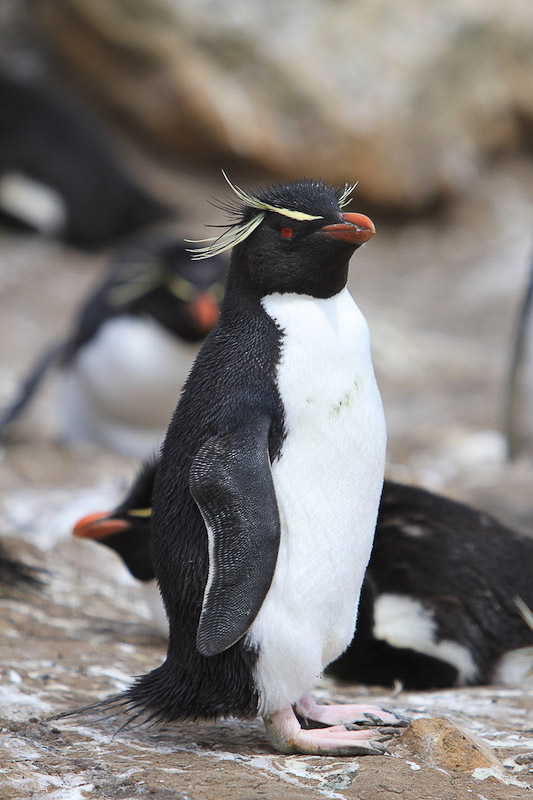 Plasticity in the foraging behavior of male Southern Rockhopper Penguins (Eudyptes chrysocome) during incubation in the Falkland/Malvinas Islands. Polar Biology, 41(9), 1801-1814.